Presenting Waiea #2101, an unrivaled paragon of modern luxury meets Hawaii lifestyle in dynamic, desirable Ward Village x2014;Architectural Digest x2019;s top master-planned community for 2017. Your truly special experience begins with a private elevator entrance leading to a spacious ocean view foyer. Step inside and become captivated by the open contemporary floor plan; Interior design work by Honolulu's Clifford Planning & Architecture. Centrally located in Kaka`ako, Honolulu x2019;s most desirable upscale walk-able neighborhood. All of your needs are within a couple blocks including Ala Moana Beach Park, Whole Foods, Ward Village dining, shopping, Ward theaters, with snorkeling, surfing and water sports directly across the street. 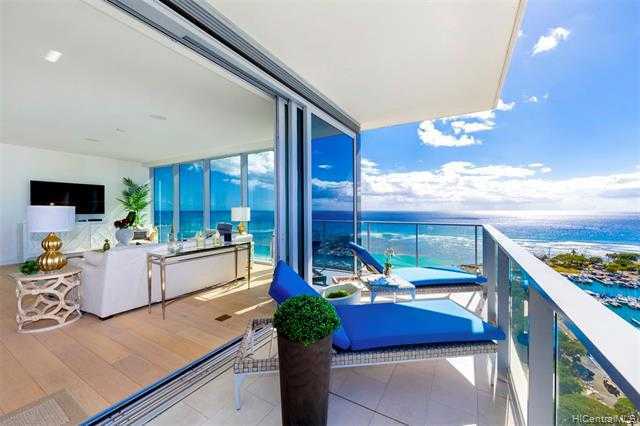 Please, send me more information on this property: MLS# 201904091 – $6,700,000 – 1118 Ala Moana Boulevard Unit 2101, Honolulu, HI 96814.